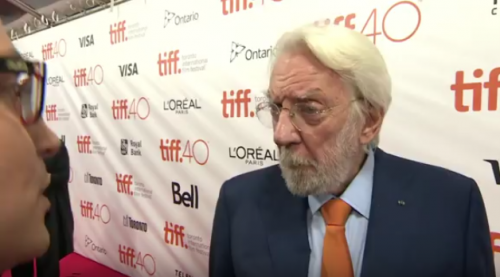 Donald Sutherland, while attending the Toronto International Film Festival, was asked about the Canadian federal election on Oct 19, 2015. Thanks to the Conservative government’s changes to the Elections Act, Sutherland as a resident of the US has been rendered unable to vote and he has been very vocal about it in the media, especially given his feelings about the current Stephen Harper government. Donald is the son-in-law of Tommy Douglas, the famed architect of Canada’s social safety net (ie. Kiefer’s grandfather). Tommy Douglas was voted best loved Canadian in a recent countrywide survey so socialism in this country is not dead, even though there’s little trace of it left after nearly ten years of this Koch Brothers-style government. 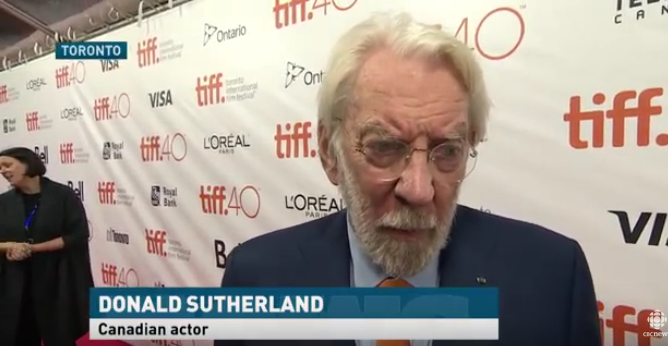 Here Sutherland replies, when asked who he’d have voted for if he could, “Tom Mulcair… NDP.” [For American readers this is the left-most of the 3 major parties here, though it has swung to the centre-right over the past few years. He seems to be wearing an NDP-orange tie, also.] It’s a very poignant short interview, in which he criticizes militarism and austerity and calls for peace. It’s heartbreaking. In only ten years we have fallen so incredibly far. Whoever you vote for, Canadians, vote carefully and just vote to rout the current oil-fuelled dark government. Because with their race-baiting, hatred, ideological austerity (“attrition” as Sutherland calls it), legislated poverty and actual criminality: enough is enough. And here’s a photo of Donald Sutherland at Occupy Vancouver. This entry was posted on Monday, October 5th, 2015 at 1:21 pm	and is filed under Canadian design, cities, film & TV, politics, video. You can follow any responses to this entry through the RSS 2.0 feed. You can leave a response, or trackback from your own site.